Crocs Megasale up to 90% Off!! It’s going to be wild. It’s going to get crazy. It’s going to be huge. More and more Crocs fans are jumping for joy, as the much-awaited, and the biggest shoe sale event in one venue is back. 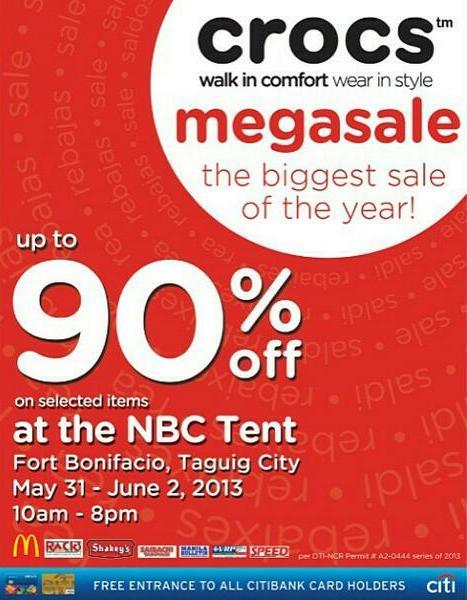 Now on its 5th year, the Crocs Megasale 2013 is happening once again at the grounds of NBC Tent in Fort Bonifacio, Taguig, with a mind-blowing price slash of up to 90%. Get your hoarding game face on, rain or shine, on May 31 to June 2, from 10am to 8pm. Free entrance for all Citibank cardholders, while there’s a P50 entrance fee for all non-Citi shoppers. Cash and all major credit cards will be accepted. Great finds for all shoe lovers from kids, teens, to adults, with over 200 designs to choose from. No one will leave the tent empty handed, as this wild Megasale will surely knock you off your feet. Make sure to come prepared with umbrellas, fans, bottled water, and face towels. The list of shoe prices will be provided onsite. Food stands will be set up by McDonald’s, Racks, Shakey’s and Saibachi. For more information about the Crocs Megasale 2013, like Crocs Philippines on Facebook and follow @crocsph on Twitter.